control the temp via Amazon’s Alexa! Pretty cool! Or warm, depending on the season. For most homes, the ecobee4 is the best smart thermostat available today. They took everything that was awesome about the ecobee3 and added Alexa right into the hardware itself. 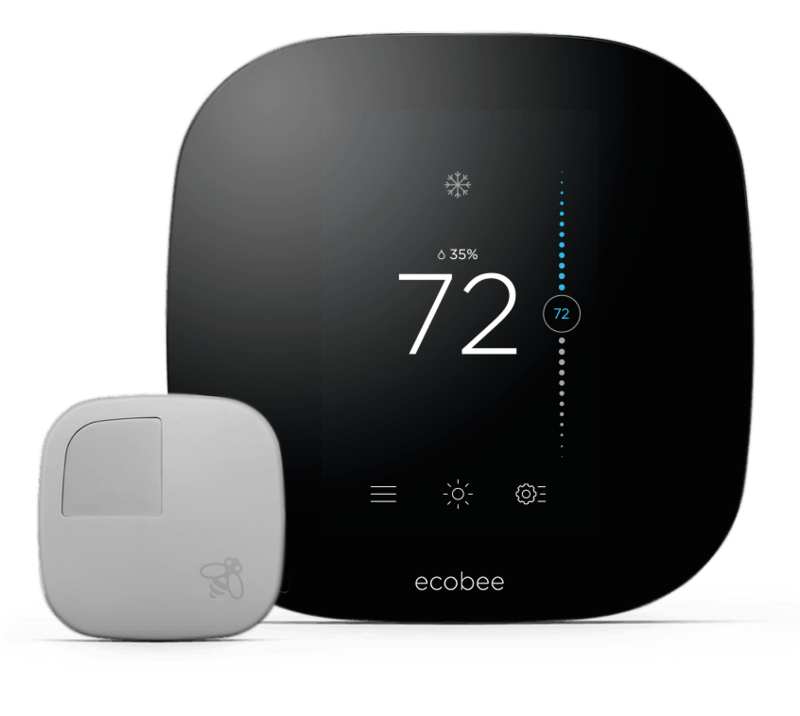 All current ecobee thermostats (ecobee3, ecobee3 lite, and now the ecobee4) support ecobee’s innovative temperature sensors (one sensor is included, and you can buy additional sensors). Place these small, wireless sensors throughout your home to give the ecobee a complete understanding of your home’s warmer and cooler rooms. The ecobee4 has a fantastic on-unit interface, but it hardly matters when you can control it effortlessly through Alexa with commands like, “Alexa, turn the temperature to 72”, or through your phone, Apple Watch, If This Then That recipes, and more. Ecobee has a long history of supporting virtually every “smart home” system on the planet, and they’ve made good on their unspoken commitment to keep up by adding support for Google Assistant this November. More reasons to love ecobee: the HomeIQ reports are a great tool for dissecting your energy usage, they give you tight control over your system’s temperature swing range, creating a schedule is easy, and the included Power Extender Kit makes the ecobee4 compatible with a variety of 24-volt HVAC system, including those without a C-wire. The only things we don’t love: disabling Alexa leaves the unit with an always-on red glowing stripe across the top, and the Echo technology that figures out which Echo is closest (in a room with multiples) is absent from the ecobee4. We are hopeful that ecobee will address these complaints in a future update. Hardly a day goes by that someone doesn’t come by this site to say they love their ecobee3, and the new ecobee4 is all that and more. The Emerson Sensi is a budget-friendly smart thermostat that boasts nearly all of the same capabilities you’d get from a more expensive smart thermostat, including Alexa integration. The Sensi can be accessed from anywhere via an app, gives you full control over your HVAC system, and doesn’t require a C-Wire in home systems that include both heat and air conditioning. The Sensi is one of the best selling smart thermostats among our readers – check it out via the links below! 2017 has been a great year for smart thermostats. Here’s a few trends we are particularly excited about. Amazon introduced the improved “Echo 2” this year, and Alexa keeps getting better. If you’ve got an Amazon Echo and a few smart devices in your home, such as Philips Hue bulbs, you already know the convenience of using your voice to make commands and ask questions. Most smart thermostats now carry the “Works with Alexa” designation, which indicates that you can add the thermostat as a device Alexa will recognize. 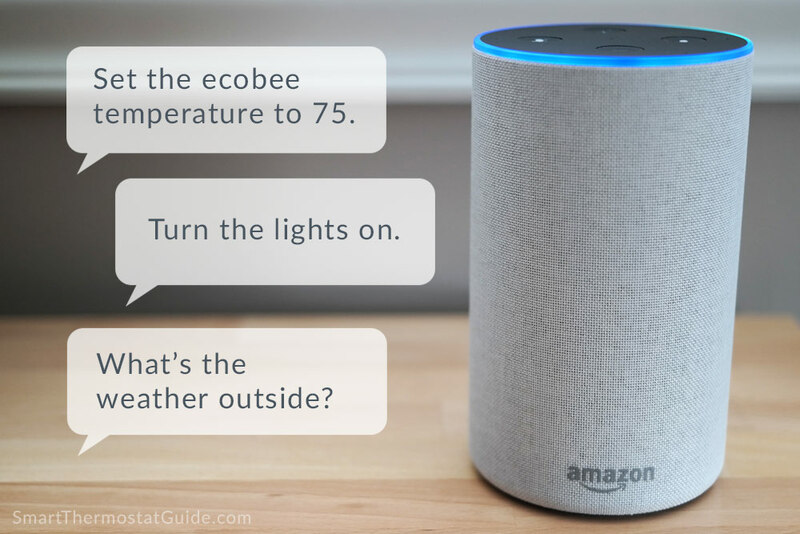 Once set up, you can issue commands such as, “Alexa, set the <Thermostat Name>’s temperature to 72”. Don’t feel left out, Google Home fans: ecobee just added support for Google Home in mid-November 2017, and Nest has had it for a couple months already. Another smart thermostat trend we’re loving this year is the addition of the “lite” model to a couple of our favorite smart thermostat families. Both ecobee and Nest rolled out “budget” versions of their flagship thermostats, the ecobee3 lite and the Nest Thermostat E, respectively. The ecobee3 lite and Nest Thermostat E are beautiful, more affordable alternatives for those with compatible HVAC systems. 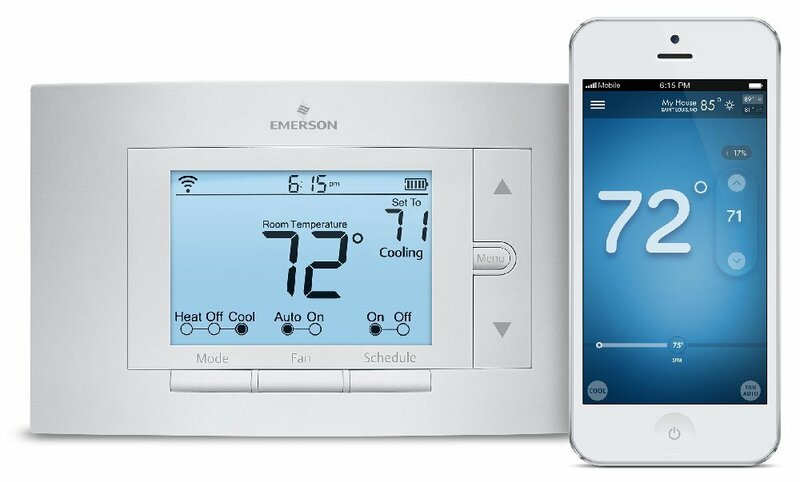 Both of these thermostats have the same “brains” as their full-featured versions – the same energy-saving features, same app, same integration with home automation systems, and the same great companies behind them. The ecobee3 lite even supports the same room temperature sensors the ecobee3 and ecobee4 do (you’ll just have to buy them separately), while the Nest Thermostat E offers a unique “frosted” screen design. The ecobee3 lite even comes with the same Power Extender Kit for better HVAC compatibility. Compatibility is more limited with the Nest Thermostat E, so be sure to check your wiring before ordering. This is a great trend smart thermostats. Lower prices makes it easier to break even on the initial buy-in cost, and the lower price helps more homeowners make the switch to these energy-saving devices. 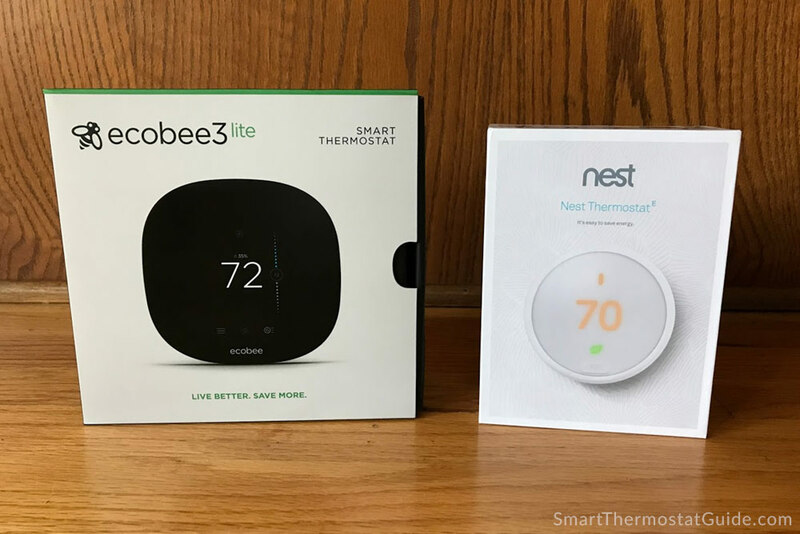 For more details, see our ecobee3 lite vs. ecobee3 comparison here, and our Nest Thermostat E review here. Why upgrade to a smart thermostat? Heating and cooling represents about 42% of your home’s energy use, and millions of people just leave the temperature set to a constant 70 degrees, even when they aren’t home. If you’re one of those people, letting a computer handle your home’s temp throughout the day (taking advantage of the times when you’re not home) could save you a small fortune (about $180 a year, according to Consumer Reports). Some manufacturers, such as Nest Labs, claim that their smart thermostats pay for themselves in as little as two years. Coupled with rebates from utility companies, that “break even” wait could be even shorter. Read more about how much money you might save with a smart thermostat. If you’ve ever struggled to program a schedule (or heck, even set the clock) on your programmable thermostat, you’ll be amazed at how much easier it is to set up a schedule on a modern day smart thermostat, regardless of which one you choose. The Nest thermostat goes one step further and attempts to “learn” your comings and goings throughout the day and builds a schedule for you. Not to mention, you can turn up the AC without leaving the sofa, preheat your home before you arrive on a wintry day, and set overrides to the usual programming with a few simple taps. 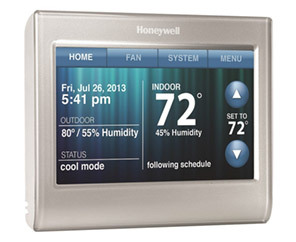 Most smart thermostats display useful info on their idle screens, too, such as the outside weather and temperature. If you’ve programmed your old-fashioned programmable thermostat to drop the temp when you’re away at work, you’re probably familiar with the pain of having to override that schedule on days you stay home. With a smart thermostat, just open the app and override the default programming – easy. No more squinting at a tiny LCD. 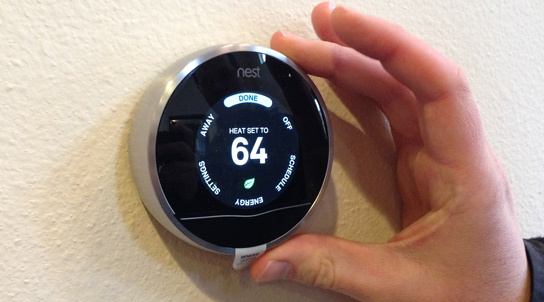 All the modern smart thermostats feature bigger, brighter screens. And they all come with companion apps and web portals so you can program your thermostat in the same way you might write an email or check Facebook. Many North American homeowners find themselves reprogramming their programmable thermostats several times a year to keep up with the shifting seasons, earlier sunsets, and twice annual time changes. Smart thermostats just keep up – time changes and seasonal shifts are taken into account and you don’t have to do a thing. A lot of home automation enthusiasts keep an eye on their homes with security cameras, like the Nest camera, but a smart thermostat also lets you know the temp. This is especially useful if you live in an extreme climate where you worry about your pipes bursting if the temp falls too low while you’re away. Most smart thermostats offer some form of usage tracking. The Nest Learning Thermostat encourages you with a green leaf icon whenever you’re using a temperature setting it thinks its “optimal” for your current weather and reports on your last 10 days of usage. The ecobee3 keeps a longer history of usage data (for those who want to really geek out about their HVAC usage). Installing a wifi enabled thermostat is about as challenging as installing a new light switch. If you’re a homeowner with a few DIY projects under your belt, you’ve probably got the experience needed to install it yourself. As a nice extra, most smart thermostats come with an optional rectangular backplate that can be used to cover up any mismatched paint jobs you might discover behind your old thermostat. Some smart thermostats (like the Nest Learning Thermostat and the Honeywell Lyric) claim they work in wiring configurations that lack a C-Wire, but we’ve heard enough horror stories about “furnace pulsing” and damages to furnace boards to take a different stance: unless your thermostat comes with an adapter designed to make up for a missing C-wire, you should install a C-wire. Professional installation will add about $150 to your costs, but the peace of mind (and avoidance of damage to your very expensive HVAC system) is worth it. Read more about the C-wire and get our recommendations for thermostats designed to work without a C-wire. We’ve been reviewing smart thermostats since 2014! We love home automation and own more Echoes, thermostats, smartphones, and Hue bulbs than you can shake a stick at.